Grow your own strawberries in time for Wimbledon! Scotland is known for its fantastic soft fruit. And with Dobbies’ helpful guide, now you can grow your own delicious strawberries right in your back garden. 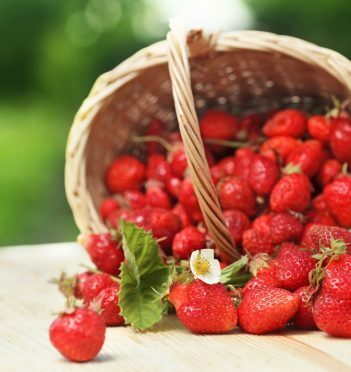 Strawberry jam, a yummy Pavlova or freshly picked with a splash of balsamic vinegar to bring out the flavour, there are many ways to enjoy the strawberries you grow. And with Wimbledon coming soon, now’s the perfect time to start growing strawberries. These eight simple steps will give you some fresh and juicy strawberries just in time for Wimbledon! Place a few of the stones (or some of the china) in the bottom of the planter. Doing this helps improve drainage and saves compost. Half fill the planter with compost. The job of the compost is to give the strawberry plants all the nutrients they need to survive and grow. Add one strawberry plant to each hole of the planter, being careful not to damage the roots. Keep putting in more compost as you go. Keep filling the planter with the strawberry plants and compost until every hole is filled and the compost is almost up to the rim. Plant some more strawberries on top, making sure each plant has plenty of space and pop in your label so you know what variety is in the planter. Give the planter a good watering, while avoiding spilling over the edge. Also, keep an eye out for water splashing out of the planter’s holes. Make sure to keep the compost moist over the coming months and watch the plants grow flowers first, then fruit. Pick the fruit when they become ripe – and try not to eat them all before you get them on the dinner table! Different varieties of strawberries prefer different conditions, but ideally locate your planter in a sunny and sheltered position so that they get all the goodness of the sun’s rays but have some protection against the wind. 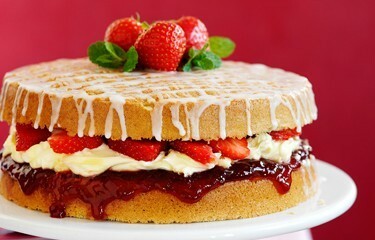 Award winning chef Adriano is the Dobbies restaurant development manager and he has dreamed up this tasty strawberry and mint afternoon tea cake, which uses not just your freshly-grown strawberries, but also some mint which you can grow in your very own herb pyramid. Just click the photo to follow the recipe.